Contact lost sometime on the 15 th . "Norman. You know my policy on arming morons.If you arm one you have arm them all. Otherwise it 's just not sporting!" The sea is the enemy of all sailors, I hope these guys are safe. This is a thirty four year old sub anything could have gone wrong and I hope they find it soon the clock is ticking. This post has been updated with additional information from U.S. Southern Command. A NASA research aircraft has joined in the search for a missing Argentine submarine and its crew of 44 and a U.S. Navy sub-hunting aircraft is on the way. A NASA P-3 Orion is now looking for the diesel-electric attack boat ARA San Juan (S-42), which has not been heard from since Wednesday, according to press reports from the region. Late Friday, U.S. Southern Command announced a U.S. Navy P-8A Poseidon left the Compalapa Air Base in El Salvador to join the search. “U.S. Southern Command (SOUTHCOM) directed the U.S. Navy to deploy a P-8A Poseidon multi-mission maritime aircraft to Bahia Blanca, Argentina, Nov. 18 to support the South American nation’s ongoing search for the submarine A.R.A. San Juan in the waters of the Southern Atlantic,” read a late Friday statement from U.S. Southern Command. In addition to NASA’s P-3 and the Navy’s P-8, the Argentine Armada has dispatched destroyer ARA Sarandí (D-13), and corvettes ARA Rosales (P-42) and ARA Drummond (P-31). Argentine naval spokesman Enrique Balbi told reporters. “We are investigating the reasons for the lack of communication,” Balbi said, according to Reuters. The submarine departed from the Argentine Armada naval base in the southern city of Ushuaia, located southwest of the Strait of Magellan, and was headed to its homeport at Mar del Plata, near Buenos Aries. The submarine was last heard from about 250 miles off of Patagonia. The NASA P-3, a modified anti-submarine warfare platform, had been operating out of Ushuaia as part of its annual Antarctic survey when it was asked to join in the search for the missing submarine, U.S. Southern Command spokesman Jose Ruiz told USNI News. Outside of the aircraft, the U.S. has not been asked to contribute assets to the search but is preparing specialized submarine rescue equipment in anticipation of a request from Buenos Aries, USNI News has learned. U.S. Navy Undersea Rescue Command is mobilizing the specialized submarine rescue equipment and personnel in San Diego to crew the Submarine Rescue Diving and Recompression System (SRDRS), two defense officials confirmed to USNI News. The system can be transported via cargo aircraft and loaded onto a surface ship for rescue operations. San Juan is one of three Argentine Armada submarines. The German-built TR-1700 attack boat joined the fleet in 1985 and completed a midlife upgrade in 2013, U.S. Naval Institute’s Combat Fleets of the World author Eric Wertheim told USNI News on Friday. The following is the complete statement from U.S. Southern Command. NAVAL STATION MAYPORT, Fla. – U.S. Southern Command (SOUTHCOM) directed the U.S. Navy to deploy a P-8A Poseidon multi-mission maritime aircraft to Bahia Blanca, Argentina, Nov. 18 to support the South American nation’s ongoing search for the submarine A.R.A. San Juan in the waters of the Southern Atlantic. The aircraft and its 21-person crew will depart El Salvador’s Comalapa Air Base, where it was supporting counter-illicit trafficking maritime patrol operations. Once in Bahia Blanca, they will join the ongoing international search for the Argentinean Navy vessel and its crew, as requested by the government of Argentina. The P-8A Poseidon is the Navy’s newest maritime, patrol and reconnaissance aircraft and is configured with state-of-the-art sensors and communications equipment, allowing it to support a wide range of missions over large bodies of water, including sub-surface search-and-rescue operations. It can reach an airspeed of 564 mph, has a ceiling of 41,000 feet and a range of 1,200 nautical miles with four hours on station, allowing it to loiter over search areas. In April, SOUTHCOM deployed a P-8A Poseidon to Galeão Air Force Base in Rio de Janeiro, Brazil, where it took part in an internationally-supported search for The Republic of Korea ship, Stella Daisy, which tragically sank in the Southern Atlantic, off the western coast of Africa. In the aftermath of Hurricane Maria, P-8A Poseidon aircraft conducted overflight assessment missions, capturing images of conditions on the ground in Dominica to support U.S. foreign disaster assistance operations led by the U.S. Agency for International Development. SOUTHCOM is one of the nation’s six geographically-focused unified commands with responsibility for U.S. military operations in the Caribbean, Central America and South America. Satellites may have detected signals possibly from the striken sub. Signals have been detected that are thought to have come from an Argentine submarine that went missing with 44 crew on board, officials say. The defence ministry is now trying to trace the location of the seven failed satellite calls received on Saturday. Argentina has stepped up the search in the South Atlantic for the ARA San Juan submarine, with a Nasa research plane joining in. The diesel-electric vessel disappeared 430km (267 miles) off the coast. Britain and countries in the region have offered assistance. The task of the rescuers has been complicated by heavy winds and high waves. The ARA San Juan was returning from a routine mission to Ushuaia, near the southern-most tip of South America, to its base at Mar del Plata, south of Buenos Aires. Its last contact with the navy command was on Wednesday morning. An Argentine destroyer and two corvettes are conducting a search around the area of the sub's last known position off the south-eastern Valdez peninsula. But so far there are no clues about its whereabouts. It is thought that the submarine may have had communication difficulties caused by a power cut. Navy protocol dictates that a vessel should come to the surface if communication has been lost. Video of the weather conditions and the Royal Navy’s Submarine Parachute Assistance Group (SPAG) at link above. The Argentine submarine ARA San Juan hasn’t been heard from in five days. Navies worldwide are scrambling to assist Argentina in locating a submarine overdue since last Wednesday. The ARA San Juan, an aging diesel electric attack submarine, was last heard from on November 15th. In response, the navies of the world—including Argentina’s wartime adversary, the UK's Royal Navy—are mounting an international rescue effort. The submarine was sailing from a base in the southern Tierra Del Fuego region of Argentina to its home port at Mar de Plata near the capital Buenos Aires. Shortly before it went missing, the captain reported a failure of the boat’s batteries as well as a second message with contents that have not been revealed. The submarine was supposed to arrive on Sunday, and its last known location was 267 miles off the coast of Argentina in the Gulf de San Jorge. Rescue efforts are concentrating within 186 square miles of the last known point of contact. The Argentine Navy and Air Force quickly mounted a search effort, and a NASA P-3 Orion research aircraft already in the area joined in, along with a U.S. Navy P-8 Poseidon maritime patrol aircraft. A second Poseidon was dispatched to Argentina this weekend, and Argentina’s neighbors Brazil and Chile are also contributing ships and aircraft to the effort. Poor weather is reportedly hampering the search, with rescue ships dealing with swells as large as two story buildings. A series of seven satellite telephone calls were originally thought to have been made by the San Juan but were later debunked. Today, November 20th, U.S. Navy officials told CNN that a series of banging noises that sounded like tools being struck against a ship hull were detected. The search is is now being narrowed down to a 35 square mile area within the original search area. Despite antagonism between the United Kingdom and Argentina over the former’s possession of the Falkland Islands and the 1982 Falklands War, the UK immediately offered to send the nearby ice patrol ship, HMS Protector. The offer was accepted. The Royal Navy is also sending the elite Submarine Parachute Assistance Group, a team of airborne-qualified rescue specialists on six hour standby to assist in submarine emergencies, to link up with Protector. Over the weekend, Three U.S. Air Force C-17 Globemaster III and one U.S. Air Force C-5 Galaxy aircraft transported a Submarine Rescue Chamber (SRC) and Remotely Operated Vehicles (ROVs) from Miramar, California to Comodoro Rivadavia, Argentina. Crucially, San Juan was built with the ability to mate with U.S. Navy deep sea rescue submersibles in emergencies thanks to a hatch standard the U.S. has encouraged other navies to adopt for decades for just this sort of situation. This should make it possible, if the submarine is located, for a ship carrying the Submarine Rescue Chamber to link up with and start offloading sailors from the stricken submarine. First developed during World War II and still used today, the SRC can rescue up to six sailors at a time at depths of up to 850 feet. The U.S. Navy is sending a second rescue system, the Pressurized Rescue Module, early this week. The PRM is capable of offloading up to 16 trapped submariners at depths of up to 2,200 feet. Disabled submarines rarely land on the ocean floor on a totally level surface, and the PRM is capable, according to USNI News, of mating to submarines at 45 degree angles in both pitch and roll. The U.S. Navy’s Underwater Rescue Command prepares a Submarine Rescue Chamber for air transport to Argentina, November 18, 2017. The incident highlights the risks smaller navies are exposed to by operating submarines without an explicit submarine rescue capability. Only the largest navies, typically those who have endured tragedies in the past, maintain the sailors and equipment to get trapped submariners out of their boats. The San Juan is one of the older submarines in service worldwide. Built in Germany, it was handed over to Argentina in 1984 along with a sister ship, Santa Cruz. The submarines displaced 2,300 tons underwater fully equipped and are 214 feet long. Each is equipped with the SMA MM/BPS-704 surface search and navigation radar, an Atlas Electronik sonar suite and Thales passive sonar arrays, and six bow-mounted 533-millimeter torpedo tubes for wire-guided torpedoes. The boats have a crew of eight officers and 21 enlisted sailors, or can alternately sail with a crew of 12 and 30 embarked Argentine naval commandos. ARGENTINA — An Argentine navy submarine that’s been missing for nearly a week may soon run out of oxygen if it hasn’t surfaced, the country’s navy says — a scenario giving urgency to a multinational search for the vessel and its 44-member crew off Argentina’s South Atlantic coast. The navy lost contact with the ARA San Juan submarine on November 15, shortly after the vessel’s captain reported a failure in the battery system while the sub was submerged, the Argentine military has said. Ships and aircraft from at least seven nations have been scouring parts of the South Atlantic for the sub. On Tuesday, three vessels will move to an expanded search area, Argentine navy spokesman Enrique Balbi said. “The search area is two times the size of Buenos Aires,” Balbi said Tuesday. A day earlier, the spokesman said the search had entered a critical phase because the ARA San Juan crew’s oxygen could run out by Wednesday in one of the worst-case scenarios. Under normal circumstances, the vessel has sufficient fuel, water, oil and oxygen to operate for weeks without external help, Balbi said, and the vessel could “snorkel” — or raise a tube to the surface — “to charge batteries and draw fresh air for the crew.” The oxygen situation also could be helped, even if the vessel bobs adrift on the surface with the hatch open. But if the sub doesn’t surface, oxygen might last only seven days, Balbi said. The vessel was submerged when the navy last made contact with it, and Tuesday would mark the sixth full day of its disappearance. The submarine was traveling from a base in far southern Argentina’s Tierra del Fuego archipelago to its home base in Mar del Plata, a city hundreds of miles to the northeast, when the Navy lost contact with it last week. The sub’s last known location in the San Jorge Gulf, off southern Argentina’s Patagonia region, is nearly midway between the bases. The vessel had been due to arrive at its destination Sunday. Shortly before the navy lost contact with the sub, the vessel’s captain reported it had experienced a “short circuit,” Argentine navy spokesman Gabriel Galeazzi said Monday. The captain was told to “change course and return to Mar del Plata,” Galeazzi said. This type of problem is considered routine, and the crew was reported safe, he added. There was one more communication with the captain before the sub went missing, Galeazzi said. The navy did not give details of its content. The San Juan is a German-built, 65-meter long (213-foot) TR-1700 submarine, powered by one electric and four diesel engines, the Argentine navy said. Approximations of oxygen in the vessel are complicated, said William Craig Reed, a former US Navy diver and submariner. “It’s dependent upon the last time they actually recharged their batteries, how long ago they refreshed the air, what’s inside the submarine,” Reed said. Peter Layton, a visiting fellow at the Griffith Asia Institute at Australia’s Griffith University, offered a scenario similar to Balbi’s: If the vessel had sunk but was still intact, Layton said, the crew would have about a week to 10 days of oxygen. If the hull is intact, it can withstand ocean depths up to about 600 meters, Layton said. If the vessel is resting on Argentina’s continental shelf, it is likely in waters shallower than this, but if it’s farther out into the Atlantic Ocean, it could be below its “crush depth” in which the hull buckles under pressure. Ships and aircraft from Argentina, the United States, Uruguay, Brazil and other nations have been searching for the sub on the surface and underwater. Earlier hopes that searchers may have heard communication attempts by the crew have not panned out, the military said. For instance, noises that had been detected Monday initially were thought to be a possible distress signal from the crew. But later analysis determined the noises were not from the missing vessel but instead might have been from the ocean or marine life, Balbi said. The Argentine navy on Saturday reported seven communication attempts that were initially believed to originate from the San Juan. But officials said Monday those calls had not come from the missing sub. There were earlier reports today that the USN believed they had located the sub in about 230 feet of water. That speculation has now been dismissed by the Argentine Navy who admit they don't know where she is. Hopefully they're on the surface somewhere as per their doctrine, as by now they should be out of oxygen if still submerged. OK your sub loses power how do you maintain buoyancy or do you sink like a rock ? I just dont see how this is going to end well for the crew. Your buoyancy has little to do with power. It has to do with how your buoyancy tanks have been trimmed. A submerged submarine is neutrally or possibly even very slightly negatively buoyant. Most submarines that I am aware of have manual means to blow their tanks (displace the water with air from the compresse air storage tanks) and therefore make themselves positively buoyant, but can only do that once or twice before recharging their air. I see it as not a very good sign that the Argentinean sub was unable to manually blow. Or maybe they did, but could not stay on the surface for some reason and then sank- now without a reserve of air to try again. There has been no sign of either red flares or the submarine emergency buoy- also not very good omens. Actually, T6, the original report is that the communication was lost in the middle of an actual transmission reporting electrical problems. That entails that, if the event that caused the loss happened at the moment of interruption, the sub was on the surface or near the surface so a comm mast could be raised. If on the surface, the sub was already in positive buoyancy condition. If near the surface, the most likely trim is a small positive buoyancy from the "quick" tanks. That's preferred option for such operation. It means that you use the planes to slightly push down to maintain depth. It's easier that way than the reverse (slight negative) mentioned by SKT, and which is used when at normal diving depth and below. As SKT indicates, the buoyancy is not directly related to the availability of electrical power, but of compressed air in the various air tanks, to be used by the authority of a certain number of people on board only (OOW, Captain, Chief of the boat) depending on the circumstances. To my mind, there is a more ominous possibility here, and I sincerely hope it's not the case. If the sub was running on the surface at the time of transmission and (as there was a storm) the boat got rolled over by a wave from the side, it may have rolled far enough to lose the air in the ballast tanks from the bottom (the bottom of ballast tanks are opened to the sea, it's the air pressure in the tank that fills them or empties them) they would have sunk in a rolled over position. At that point, there is no amount of air in your various reserve that can save you because any air you use will also go right out of the bottom instead of pushing the water out. One of the (unreported) fact that leads me to believe this is a strong possibility is the fact that there are no reports of the submarine emergency buoy's signal having been picked up. The buoy has it's own battery and is manual release to free float to the surface. With all the assets and the knowledge of the approximate whereabouts of the sub at the time of the last communication, getting the buoy's signal should have happened by now with all the assets in area, should it have been released. That's where my fear comes from: No buoys would indicate it was either not deployed or if deployment was attempted, it was not in a position to float free: a rolled over submarine. On the other hand, the absence of such buoy may also (fingers crossed) indicate that there is no submarine emergency, just a complete loss of power/communications in which case, the submarine should be nearing it's destination any day now. When the news was released the Kursk tragedy came to mind. Same...at least the Argentines are asking for help, unlike the Russians. There are some Argentines, of course, that are looking the gift horse in the mouth from the Brits . How far out rom the Falklands is British territory ? Not really sure of their security/economic zones...I'd imagine about 3-12 miles if it's anything like what we have. The Argies claim to the continental shelf, so that the Falklands are encompassed. Looking at the route given I suspect they were poking around the Falklands at some point gathering intel or practicing such. British territorial waters is 12 nautical miles around the Falklands, with the economic exclusive zone, which otherwise remains international waters, extending to 200 nautical miles. They were not "poking around" the Falklands. That map is deceiving. You need to use a globe, a polyconic or a zenith equidistant projection chart. If you do so, you will note that the great circle route (the most direct route between two points on the earth's surface) between the Tierra del Fuego and Mar del Plata passes right off (almost touches) the Falkland Islands. This is what explains the little dip where they strayed from that direct route to avoid British territorial waters. On the map provided, to figure the great circle route, you have to imagine a perfect arc of a circle that would go from Tierra del Fuego to Mar del Plata just touching the closest point of the Falkland Islands. The other deceiving aspect of the chart is that if you use the proper projection chart, you will see that the boat never strays from being over the continental shelf, even if they do get close to its edge North of the Falklands. But they never get over "deep" ocean as the BBC map would seem to indicate. A sound detected in the search for a missing submarine with 44 crew members aboard is consistent with a non-nuclear explosion, officials in Argentina said Thursday. Navy spokesman Enrique Balbi said the relatives of the crew have been informed and that the search will continue until there is full certainty about the fate of the ARA San Juan. The disclosure was made as more help arrived in a multinational search as concern grew that the vessel's oxygen supply could soon start to run out. Britain's Ministry of Defense sent a special helicopter with emergency life support pods to join the hunt that includes planes and ships from a dozen nations. Balbi said Wednesday that searchers were returning to a previously scanned part of the ocean after determining that a previously unnoticed "hydro-acoustic anomaly" was detected Nov. 15, just hours after the final contact with the ARA San Juan. He said Argentine navy ships as well as a U.S. P-8 Poseidon aircraft and a Brazilian air force plane would return to the area to check out the sound, which originated about 30 miles north of the submarine's last registered position. U.S. Navy Lt. Lily Hinz later said the unusual sound detected underwater could not be attributed to marine life or naturally occurring noise in the ocean. "It was not a whale, and it is not a regularly occurring sound," Hinz said. A U.S. Navy plane detected an object Wednesday near the area the submarine sent its last signal during a search flight over the South Atlantic, a witness told Reuters after traveling on board the plane. The crew emphasized that the object could not be identified, and it was not known if it was related to the ARA San Juan, the news agency reported. The San Juan, a German-built diesel-electric sub, went missing as it was sailing from the extreme southern port of Ushuaia to the city of Mar del Plata, about 250 miles southeast of Buenos Aires. Experts worry that oxygen for the crew would last only seven to 10 days if the sub was intact but submerged. Authorities do not know if the sub rose to the surface to replenish its oxygen supply and charge batteries, however. More than a dozen airplanes and ships are participating in the multinational search despite stormy weather that has caused waves of more than 20 feet. Search teams are combing an area of some 185,000 square miles, which is roughly the size of Spain. The U.S. government has sent two P-8 Poseidons, a naval research ship, a submarine rescue chamber and sonar-equipped underwater vehicles. U.S. Navy sailors from the San Diego-based Undersea Rescue Command are also helping with the search. Worth getting out of bed this morning - learned something new . A gentleman in the cubicle behind me is a retired Submariner. He was apparently being interviewed on radio this AM about what may or may not have happened. He said it "might" have been a battery explosion that was heard. If that was indeed the case, they would have lost at least one compartment if not more. That would make it very difficult for the boat to surface if not impossible and that there could have been some survivors if she went to the bottom and not hit crush depth. The atmosphere there now would be very poisonous and it doesn't look at all hopeful for the crew. If the beacon was in the compartment where the something happened, it would be impossible for crew to launch the buoy and to his recollection that type only carries one. He did say that if a boat does go to crush depth, the end is swift with the hull collapsing from both ends towards the middle at once, like stomping on a pop can. He also said that even if they were in shallow enough water to egress, the conditions on top would be challenging to survive for this length of time. Understandably, the family members of the crew were not happy with the announcement (a week late) of hearing what appears to be an explosion. Those poor people. You'd have thought that SOSUS (or what passes for it now) would have picked up something...or am I smoking crack? Well, you are smoking something MM. SOSUS or whatever the current system's name is, is a NATO system for the North Atlantic. It has no station from the Southern Atlantic feeding into it. I don't believe that Argentina or the UK operate any system similar to that in that area of the South Atlantic. However, there may be (and probably are) many local systems of hydrophones belonging to military organizations or research establishments that would record, but not necessarily be permanently monitored, sound in the general area but in a more localized area. That data is probably what the Argentinian Navy has gotten access to and has now started to review for any indication and found the ominous sound, as reported on TV, consistent with an implosion. By the way, JJT's friend is quite correct, in a cold crush event, the end is mercifully swift for submariners. In a lack of oxygen case, the end is painless, as you pass out before death, but the mental anguish of the long lead time is unimaginable. It would appear to have done so, but uncertain when such correlated information was passed to the Argentine Navy. Retroactively, the acoustic event signature correlated against the last known transmission indicating a major malfunction, certainly doesn't bode well, and one can only imagine how much the families would have liked to have been provided more detailed information sooner. A very sad situation indeed. Well Argentina just confirmed the death of the 44 sailors on board. The worst of the scenarios was confirmed early in the morning by the Argentine navy, when it brought together the family members of the crew to tell them that the sad message of the death of the 44 crewmembers of the submarine ARA San Juan had disappeared last week. The Argentinian navy reported yesterday that it was analyzing a 'hydroacoustic anomaly' that was detected a week ago in the Atlantic where the last known position of the submarine ARA San Juan was remedied, a sound almost three hours after the last communication with the ship . Captain Enrique Balbi told the media at the headquarters of the navy in Buenos Aires that a warning was received responding to a 'hydroacoustic anomaly' observed at the last known position of the submarine last Wednesday in the Gulf Gulf San Jorge, 432 kilometers off the coast of Argentine Patagonia. "The United States - one of the 13 countries that work together to search for submersible pumps - asked for (data) different bodies that focus on collecting different hydroacoustic events around the world," he added. After collecting all information and conducting a thorough centralized analysis in the United States, that official indication was received corresponding to Wednesday, November 15 in the morning, coinciding with the area of ​​the last known position of the submarine. "This would be about 30 miles north of that position, on the way to Mar del Plata," the Buenos Aires city to which the ship left from the southern port of Ushuaia and where it would have arrived between Sunday and Monday. The hydroacoustic anomaly and the US Navy report were reviewed in Argentina and sent to other international organizations that confirmed that it was an underwater explosion in the area where the submarine would be located. The Navy gathered the family members and handed over the terrible news. The impact on the family members of the crew was terrible. Many of them have left the meeting and complain about the management of the situation by the government and the Argentine navy. The relatives wonder how it is possible that they were kept in suspense for a week by mobilizing the operation if the data to locate the San Juan were available from the same day the disaster took place. On the other hand, the family members continue to emphasize that the crew was condemned from the moment the submarine went to sea because of the poor state of maintenance it was in. Argentina is one of the countries in Latin America that has invested least in defense since the time of 'Kirschnerism' that led the armed forces to a state of neglect that is now being paid. However, little has been revealed about how the Argentine Navy confirmed the death of the sailors. It is known that the ship Cabo de Hornos of the Chilean navy and the Skandi Patagonia, a ship of the French oil company Total with an underwater rescue squadron of the US Navy, were in the vicinity of the accident. The latest information indicates that the destruction of the submarine may be due to the explosion of one of its batteries due to a possible short circuit. Rest in peace the brave companions of the sea. Was saying that regardless, I don't see this ending well...as I posted, the Argentine Navy has confirmed it. RIP submariners. SOSUS or whatever the current system's name is..
RIP to all hands lost in the tragedy. A dark day indeed. Many a silent drink will be drunk in submarines around the world tonight. The silent service even honours its dead in silence. Rest in the depth. May lord Neptune hosts you at his great banquet. And condolences to all the families of the departed. Very saddened to see this come to pass. We're all, as sailors, at the mercy of the sea regardless of which nation we serve. I hate it when she takes some of us as it could be any one of us if our number comes up. I hope it was swift. My thoughts are with their families today. Now they just need to find the sub. A picture gallery of the crew.One thing that strikes me is the age of the sailors,which seems that they were older men. The German-built diesel-electric TR-1700 class submarine was commissioned in 1985 and was most recently refitted in 2014. During the $12 million retrofitting, the vessel was cut in half and had its engines and batteries replaced. Experts say that refits can be difficult because they involve integrating systems produced by different manufacturers and even the smallest mistake during the cutting phase of the operation can put the safety of the ship and the crew at risk. I think that if you took a look at RCN/RN/RAN/RNZN sub (and surface fleet) crews, you'll find they are in general older than USN ones. I definitely noticed it when working with Americans. Nah they just look older due to stress of sailing in smaller more cramped subs. Not the pleasure cruisers the US operate. Small tidbits of details... Water entered missing Argentine sub's snorkel, causing short circuit. How is that possible ? To have water come through the snorkel. Second once you have that issue why not surface despite the stormy sea and return to base ? I didn't sail on subs, but I have a few friends who did. My understanding is that the sub doesn't completely surface to snorkel; it's entirely submerged and only the snort mast extends from the water. Apparently there is a valve on the snort mast that normally keeps seawater from coming in, but my friends have mentioned that keeping the sub depth constant is somewhat of an art, and if the sub goes ever slightly too deep and water hits the valve, it will slam shut - causing distress to the crew because the diesel engine then tries to pull air from inside the sub, and makes your ears hurt like hell. Extrapolating from what they've told me, I guess if that valve didn't work properly, it would allow water to get into the snort mast. My understanding is that submarines while on the surface are not particularly stable in rough weather, and they would avoid this if possible. Thanks for the education. I guess submarine service is not for the faint of heart. When l was an MP stationed at Shearwater, l remember when the LA Class sub USS Philadelphia paid a visit to A Jetty. They came in on the heels of a bad storm that was so rough it caused hundreds of thousands of dollars if not more damage to the cargo of an auto carrier that came to the auto port at the same time. In speaking to a crewmember of the sub they told me they had stayed near the surface in the storm until about 90% of the crew were puking as the old man's wife was waiting in port and he really, really wanted to come in. They dove to get out of the roil and settle her down and IIRC they needed to be below 100 feet before the surface action wasn't moving them all over. She was a good sized boat, not a small girl like the Argentine. I can just imagine if the weather when they were snorting was getting in the 3 m wave height the search ships were facing that they would have been slamming all over the place. As for finding it, hell we are still locating subs that went missing almost 100 years ago, it could be missing for quite some time. People really don't have a grasp of just how big the ocean is. The search for a missing Argentine submarine will continue but the rescue part of the plan has ended, a spokesman for the navy said on Thursday. Argentine navy spokesman Enrique Balbi said the mission "extended for more than twice what is estimated for a rescue." The search for the ARA San Juan has lasted for 15 days since it first went missing on Nov. 15. 44 crew members were on board the vessel. The submarine was sailing from the extreme southern port of Ushuaia to the coastal city of Mar del Plata It was originally scheduled to arrive last Monday at a navy base there. After several dead-end discoveries, investigators confirmed that an explosion occurred near the time and place where the sub went missing. Hopes for survivors had already dimmed because experts say the crew only had enough oxygen to last up to 10 days if the sub remained intact under the sea. Argentina's navy announced early Saturday that searchers had found the missing submarine ARA San Juan deep in the Atlantic a year after it disappeared with a crew of 44 aboard. 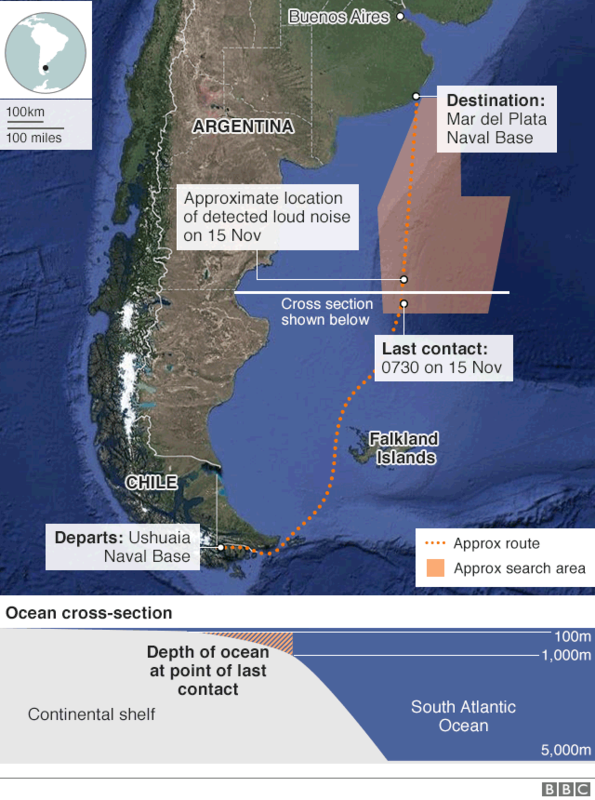 The vessel was detected 800 metres deep in waters off the Valdes Peninsula in Argentine Patagonia, the statement said. The navy said a "positive identification" had been made by a remote-operated submersible from the American ship Ocean Infinity, which was hired for the latest search for the missing vessel. The discovery was announced just two days after families of the missing sailors held a commemoration one year after the sub disappeared on Nov. 15, 2017. On Thursday, on the anniversary of the disappearance, President Mauricio Macri said the families of the submariners should not feel alone and delivered an "absolute and non-negotiable commitment" to find "the truth." Macri promised a full investigation after the submarine was lost. Federal police raided naval bases and other buildings last January as part of the probe, soon after the government dismissed the head of the navy. The San Juan was returning to its base in the coastal city of Mar del Plata when contact was lost. Argentina gave up hope of finding survivors after an intense search aided by 18 countries, but the navy has continued searching for the vessel. The German-built diesel-electric TR-1700 class submarine was commissioned in the mid-1980s and was most recently refitted between 2008 and 2014. During the $12 US million retrofitting, the vessel was cut in half and had its engines and batteries replaced. Experts said refits can be difficult because they involve integrating systems produced by different manufacturers, and even the tiniest mistake during the cutting phase can put the safety of the ship and crew at risk. The navy said previously the captain reported on Nov. 15 that water entered the snorkel and caused one of the sub's batteries to short-circuit. The captain later communicated that it had been contained. Some hours later, an explosion was detected near the time and place where the San Juan was last heard from. The navy said the blast could have been caused by a "concentration of hydrogen" triggered by the battery problem reported by the captain. Now the big decision raise the sub or leave it as a grave. The need to find a cause should be the driving force. Give the families some closure. Both the USN and Royal Navy among others have the means to raise the sub. Argentina does not have the money, a visual inspection will give a lot of clues, but I think it's a watery grave for them. Eternal patrol. Even the Kursk was raised.Maybe its too deep to raise ? It might be a small price for peace for the Falklands if the Brits offer to raise the sub. I could see the US and maybe Norway assisting the effort. Photos have been released and it aint pretty.